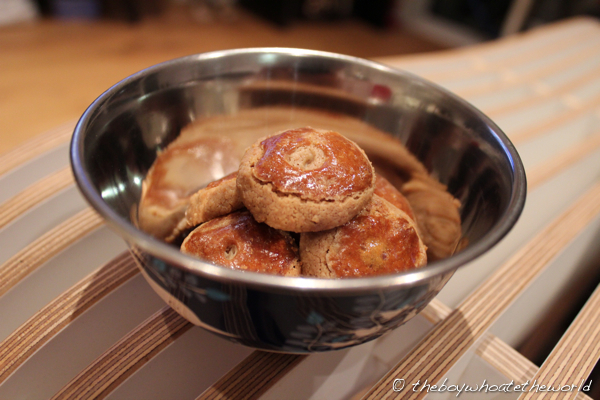 To usher in the year of the dragon, I thought it would be fitting to bake my favourite Chinese New Year cookie of them all… the humble Peanut Cookie. I recall gorging on entire jars of these melt-in-the-mouth lovelies as a kid… paying the price the next day for the inevitable sore-throat which followed. Being the complete Baking Noob that I am, this brilliant Peanut Cookie recipe which I spied on Bread et Butter’s blog was right up my street. A surprisingly simple 5 ingredients is all it requires and there’s no faffing around with measuring out micrograms of stuff… you can just chuck eveything into your mixing bowl by the cupful (as Suyin says…just remember to use the same cup to measure throughout). As I used ready Roasted & Salted nuts, I had to adapt the recipe slightly as I found they already had quite a lot of oil and salt in them, but do follow her recipe to the letter if using unroasted peanuts. Blend the Peanuts in a food processor until it forms a fine powder (it doesn’t need to be overly fine if you don’t want it that way… in fact, I found having a few imperfect bits gave the cookies a crunchy texture). Add the crushed Peanuts, Flour and Icing Sugar into a large mixing bowl. Mix throughly with a spatula. Pour in the corn oil bit by bit into the bowl with the rest of the ingredients, stopping after each pour to thoroughly mix the ingredients together. As you add more oil and stir, what’s in the bowl will start to morph into a workable dough. The consistency you are aiming for is one of ‘clay’ that holds together (you should be able to roll a ball easily without the dough crumbling or sticking to your hands). If it’s still crumbly, add a bit more oil. If the dough is too wet and sticks to your hands such that you can’t form a ball, add more peanuts and flour in a 2:1 ratio to get the right texture. Line a flat baking sheet / tray with slightly greased parchment paper. 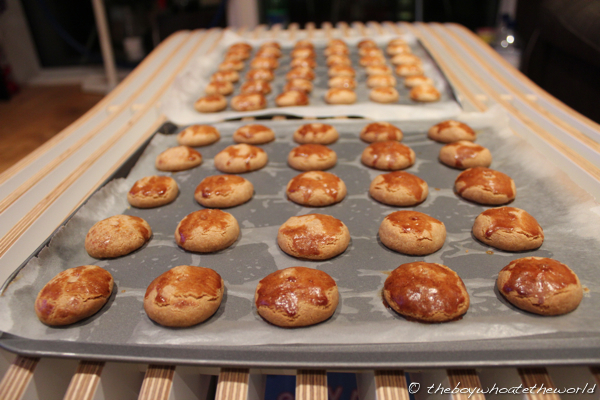 Using your hands, make little balls of dough, each about the size of a small bottle cap and place on the baking sheet. With a chopstick, poke a decorative hole in the centre of each cookie dough ball and brush lightly with egg-wash.
Bake in the oven for 15-20 minutes until golden brown. There’s nothing more beautiful than the just baked, roasted peanutty aromas that fill the kitchen as these come hot out of the oven. Happy Chinese New Year and Keong Hee Huat Chye to all! I hope everyone has a rollickingly prosperous year ahead. Lets hope that the couple of batches I’m sending to represent in our charity office bake-off at work kick some arse! They look great! Glad you liked the recipe – I loved how fuss free it was, I’m incredibly lazy when it comes to measuring ingredients! Hope you had fun eating them, and good luck for the bake-off! They look awesome and such a simple recipe. Ms P and I def be making these on the weekend. @TC’s Foodland: As far as baking goes, it’s as easy as it gets! Let me know how it goes! this recipe is great i think whoever reads this article shouyld atleast try it .. try this and you can also try http://www.textme4free.com the website to use to text anywhere in the uk for free! !Thanks again for the recipe.